Jodi Levitz, chair of strings and co-chair of the chamber music program at the San Francisco Conservatory of Music, performs J. S. Bach’s Suite No. 2 in D Minor, BWV 1008 for the Conservatory’s Faculty Artist Series (2013). 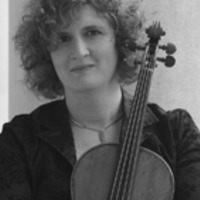 Jodi Levitz is an active performer of international reputation and passionate advocate of new music for viola. She was principal viola and soloist with the Italian chamber group I Solisti Veneti for 12 years, a position she won while still a student at The Juilliard School. She has performed as soloist throughout Europe, South America, the United States and East Asia, and she has recorded works of Cambini, Giuliani, Hummel, Porter, Mendelssohn, Rolla, Schoenberg and Schubert on the Concerto, Dynamic, Naxos and Erato labels.